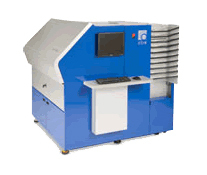 Complete print jobs will exit the machine fully cut, collated and color-matched. This affordable and fully automated, highly productive imaging system will give small and medium size labs a competitive advantage and will help attract new business while providing larger labs with a fast and compact self-contained system that can support all of their printing needs. The Chromira ProLab is a fully integrated, 30" digital RA-4 printer/processor lab system, designed to deliver continuous digital print production of precisely assembled and collated orders, ideal for any market. The convenience of its daylight-loading feature (requiring no paper cassettes) and very small footprint makes it adaptable enough for today's space-conscious digital mini-labs. Chromira ProLab automatically nests, sorts, back prints and collates package orders, producing final XY-cut print sizes from 3.5x5” to 30 inches x 164 feet. With high-volume 24 IPM imaging speed, distributed front-end network image submission, an exclusive on-the-fly image processing workflow, and other productivity characteristics, the Chromira ProLab offers it all. For even greater productivity, the Chromira ProLab system is compatible with ZBE's powerful WorkStream Imaging Automation software suite, which integrates the entire process of order creation, color correction, cropping and retouching, and printing.